Stuck for interesting ideas to feed your kids in the morning to get them going before school? School mornings can be crazy! On top of trying to get everyone up and ready and to school on time, there’s breakfast to think about. Luckily, making something healthy and filling and wholesome does not have to take forever! 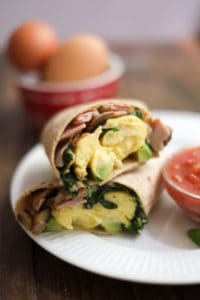 These simple and delicious ham and veggie breakfast burritos can be whipped up in just minutes – and keep you full for hours! … and ready in less than ten minutes! Our first step is to get that skillet heating up while we grab all our supplies. Planning ahead helps save time, even in little ways like this! Once heated, spray pan and add ham, pre-chopped mushrooms (another time-saver!) and spinach. Feel free to just rip the ham up as you toss it in the pan if you want to save some chopping time and dishes. And if you want smaller spinach or mushroom pieces, just tear them as you toss them in as well. Now sprinkle on some garlic powder if you want a little extra flavor (I’ve tried it with and without – good both ways!). While these are cooking, crack your eggs into a small bowl and whisk them up with a dash of milk. Set these aside to use in just a minute. Once the spinach is wilted and the mushrooms are soft to-your-liking (about 5 minutes), scoop everything into a medium bowl to save for later. Unless, of course, you want to have the ham and veggies cooked into the eggs – then feel free to skip this step. Put the same skillet back onto the stove and again spray or grease it. Pour in your previously scrambled eggs, season with salt and pepper, and cook to your liking. Time to plop everything on to those delicious whole wheat tortillas. And don’t forget to top them with shredded mozzarella and a bit of avocado scooped right out of the skin. Now fold up and devour! I love eating my breakfast burritos with some fresh salsa, but they’re flavorful on their own as well. See how quick that was? And only a skillet, a few utensils and small bowl to clean! Not bad for a hot, nutritious breakfast, if you ask me! Spray a large skillet with your choice of cooking spray and place over medium-high heat. Add ham, spinach, and mushrooms. Saute until spinach is wilted and mushrooms are soft. Scoop everything out into a dish to save for later. Re-apply cooking spray and pour in whisked egg mixture. Cook until eggs are no longer runny and season with salt and pepper to taste. Lay out six tortillas and divide the ham-mushroom mixture evenly among them, then do the same with the eggs. Top each tortilla stack with a small handful of mozzarella cheese and some slices of avocado. Fold up tortillas and serve warm with salsa or hot sauce.